A Simple Slice of Science – How can I make two of me? How can I make two of me? I think if Abigail is asking these questions at the age of six then she will really go far, don’t you agree? Here is what Dr. Simple has to say on the matter… and don’t adjust your screens if you think you are seeing double! So there you have it! Hopefully a simple answer to a really wonderful question. 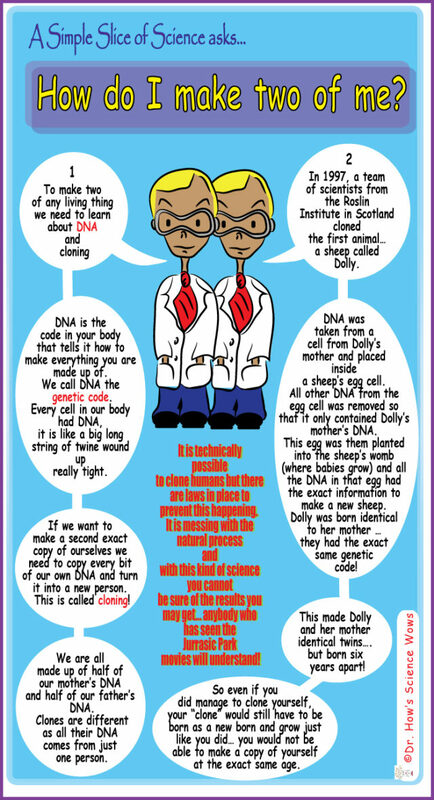 It certainly opens up the discussion of whether we should be cloning or not. As a geneticist myself I wouldn’t be encouraging it, but I do have a much simpler answer… I reckon if Abigail could just build herself a Transmogrifier then she will really have nailed the whole cloning thing. She could turn herself into another Abigail and the job would be done! If you do make one Abigail, can I borrow it? I love these posts :). Keep them coming! Emily recently posted…Inktense Blocks Painting Tutorial – and Giveaway! Sara recently posted…Feeling a bit blah..